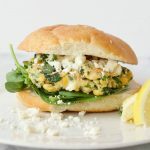 These spinach and feta chickpea burgers are super easy to make, and take just 6 ingredients and 10 minutes! A simple gluten-free and vegetarian dinner idea that’s full of flavor. In a large bowl, mash together chickpeas, flour, garlic powder, and pepper thoroughly. Stir in spinach and feta cheese until combined. Form mixture into three patties, and set aside. Add burgers and cook 2-3 minutes on each side until golden brown. Store leftovers in the refrigerator for up to 4 days, or up to a month in the freezer. Make sure to mash beans well to allow the mixture to hold its shape. You can test the mixture by squeezing a portion of it in your hands to see if it sticks together. If not, keep mashing, or add a little more flour if it’s too wet, or a little water if it’s too dry. These can be frozen before or after cooking. Make sure they are completely cooled if cooked, and lay flat before freezing to avoid sticking together. Serve on a burger bun with hummus, or over a bed of greens.